Starkey is a global hearing technology company based in Minnesota, USA. Starkey’s story began when Harold Starkey opened his first laboratory in 1963. William F. Austin then bought Starkey Laboratories in 1967 and Starkey Hearing Technologies was born. Since that day, Starkey has been creating world firsts in hearing aid technology, including the world’s first custom In-The-Ear hearing aid (1971), the world’s first Completely-In-Canal hearing aid (1992) and the world’s first Invisible-In-Canal hearing aid (2010). And, in 2019, they will be releasing the world’s first ‘Healthable’ hearing aid! Starkey not only believes in producing hearing aids but in connecting people and changing their lives. Their goal is to empower you to reach your full potential, bringing measurable improvement to your hearing. Because hearing is their concern for everyone, in 1984 Starkey began the Starkey Hearing Foundation, where people in need are fitted with free hearing aids. The Foundation has assisted over a million people around the globe, continuing to help as many people as possible to hear. Starkey has many styles of hearing aids, with beautiful designs and advanced technology. The style you choose will depend on your preference, your hearing loss and what your hearing healthcare professional considers the most appropriate for your hearing needs. The most familiar style of hearing aid with all components cased in a piece that sits behind the ear and a mould (custom or dome piece), which carries the sound into your ear canal. Being a smaller BTE hearing aid, this is a discreet style of hearing aid. Starkey has two sizes for the RIC: the Micro RIC which has a miniature device behind the ear and the slightly bigger Standard RIC. Both have an ultra-thin tube carrying a wire to a soft dome, which holds the hearing aid receiver. This part, as the name suggests, sits in the ear. A custom made hearing aid, where a hearing professional takes an impression of your ear. Being the largest inside the ear style it will accommodate hearing losses up to the severe range. The ITE is easier to handle for those with dexterity issues. A smaller version of above, offering a more discreet hearing aid style, with a smaller portion of the hearing aid visible in the outer part of your ear. Hidden completely in the canal, this tiny device is barely visible. This device has a tiny removal handle – the only part that can be seen outside the ear canal. Sitting deep in the ear canal and custom-made for you. The Starkey design in completely invisible in most ears. The higher the technology level, the more features you will find on the hearing aid and the more programming ability your hearing healthcare professional will have to customise your device to suit your specific needs. Some people have complex hearing requirements. If you fall into that range, higher performance levels will provide more solutions, delivering improved hearing across a wider range of settings. Starkey wants to help you hear in all listening environments and improve your quality of life. Discuss your communication needs with your hearing healthcare professional to help determine the performance level that’s right for you. Acuity Immersion will bring presence to your hearing as it accesses a wide range of frequencies. This feature is designed to give you more environmental awareness. The placement of the microphone will improve your access to high-frequency information, giving you an enriched sound experience. Acuity Immersion Directionality provides a more natural listening experience. If your hearing aid has directional microphones this feature utilises adaptive listening to preserve all speech sounds and return to you all the natural advantages of your ear in difficult communication situations. It will give you a hi-fi listening experience and increase conversation participation as you will be able to hear speech, no matter what direction it is coming from. Acuity Quiet will preserve your peace and quiet! Keeping the background noise where it should be – in the background, Acuity Quiet will give you a clear listening experience regardless of the noise going on around you. Interactive Intelligence knows your listening environment is constantly changing. This feature will transition you smoothly between situations, in real time. Music Adaptation and Memory & Music Enhancement for your individual discernment in music. This characteristic allows your hearing aid to adapt to your tastes and remember your music preferences. You will hear rich notes and enjoy full sound quality. Ultra-High Definition Sound as the name suggests, will provide you with high definition sound quality, using wireless technology. This gives you with a natural, synchronised listening experience. Acuity Binaural Imaging makes use of both your ears, as we have two for a reason! Sound input from both sides, gives us balanced binaural awareness of sound. This feature will give you back this balance while preserving the clarity of speech. Acuity Lifescape Analyzer was designed for complex and difficult communication situations. This technology enables your hearing aid to cope with, and adjust to, many and varied listening environments simultaneously. Ear-to-Ear Phone Steaming means syncing both ears to incoming phone calls for improved binaural listening. And if you have an iPhone you can stream phone calls directly to your ears from the phone. Speech Shift is required for the sounds you don’t or can’t hear, due to your hearing levels. This technology will move those sounds to a frequency range you can hear, ensuring you don’t miss out on any important speech signals. Multiflex Tinnitus Technology can help you if you suffer from tinnitus (ringing or buzzing sounds in the ear). Geotagging technology utilises the GPS feature on your phone. It will intuitively switch listening modes when it detects you are in a location you have previously tagged. This could be your favourite restaurant, your work, your home, the MCG, your dance class – it doesn’t matter. Whatever the environment, ask your hearing aid to remember it and tag it for future reference. In April 2019, Starkey will lead the world with another first – a ‘Healthable’ hearing device. Not only will it provide you with amazing sound quality and speech clarity, it will be able to track your physical and brain health. You will experience a 50% reduction in background noise, which means easier listening in difficult environments. You will also be able to use your hearing aid, via AI or Artificial Intelligence, to track your health. 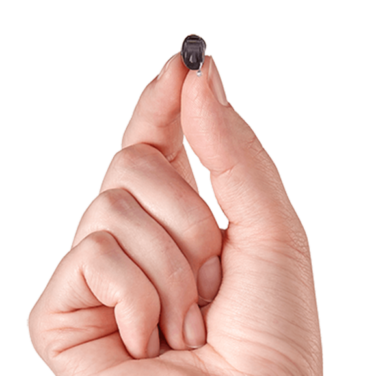 The Livio AI will integrate information received by sensors on the hearing aid to assess your physical activity and detect if you’ve had a fall or, if required, provide language translation. Amazing! This means the Livio AI will not only provide you with the best listening experience, but will be able to monitor your overall health. Research has shown there are links between hearing loss, dementia, anxiety and isolation. Starkey attempts to assist with these related health issues through the Livio AI. This hearing aid comes with the Thrive Hearing App which will track your steps and daily movement giving you a ‘Body Score’. It will also measure how much benefit the hearing aid is providing your brain by tracking the number of hours you wear your hearing aid and the active listening environments you are engaged in. This will give you a ‘Brain Score’. The Body and Brain scores are then combined to give you a picture of your overall health and wellbeing. Incredible! And it’s hard enough travelling to a place where you don’t speak the language, let alone doing it with a hearing loss. But the Livio AI can assist with that via the Language Translation feature on the Thrive Hearing App. The app will translate the language you select and send the translation direct to your hearing aid, at your hearing preference level. It will also translate your speech back to the person you are communicating with so they understand what you are saying. This opens a whole new world of travel experiences for you. Fantastic! A fall detection sensor is also included in this hearing aid. If you have a fall, your loved ones will receive a text message, alerting them that you need assistance. A great initiative for this Healthable device. You can also utilise the Tap Control to start or stop streaming into your hearing aid. Just tap your hearing aid twice and the streaming sound is muted for you to hear speech or sound from a different source, then tap it twice again to restart the streaming. The Livio AI comes in four technology levels with the new AI Premium i2400 level being introduced. It is suitable for all hearing levels and can be fitted in a RIC or BTE style. If you are after the latest hearing device, that will give you the ultimate hearing experience and track your health status, be the first in line to buy this hearing aid come April 2019. The Muse IQ utilises the Acuity operating system and provides outstanding speech processing and listening clarity. 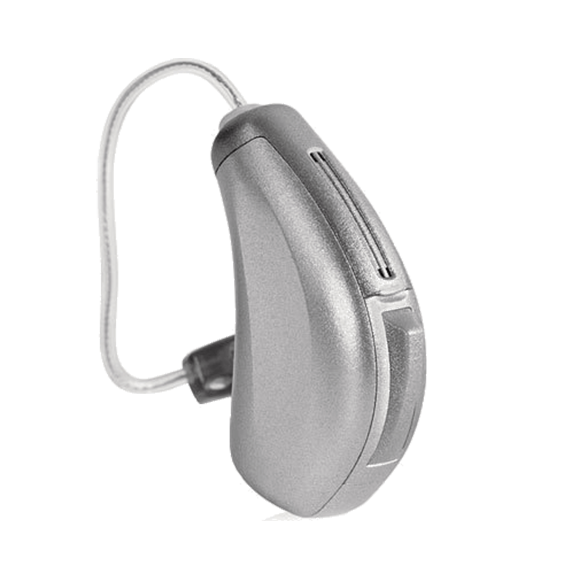 All the Acuity features can be found in this model, across the three technology levels and in all hearing aid styles. 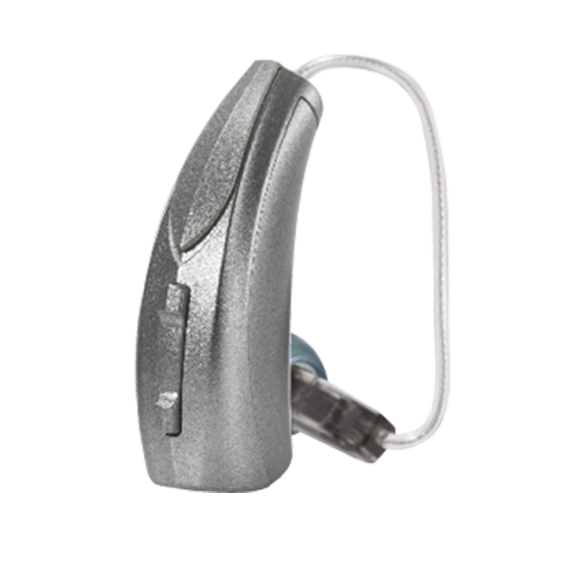 This hearing aid will adapt quickly to fluctuating environments utilising Interactive Intelligence features. Applying wireless technology the Muse IQ offers natural sound quality and streaming capabilities with SurfLink accessories. You will experience ear-to-ear streamed phone calls, beautiful music quality and control of your hearing aid from a remote device. You also have the option of the telecoil function. The Muse iQ provides a hearing device solution no matter the level of your hearing or the style you want. 1. Muse IQ–R This lithium ion rechargeable option is one of the best on the market with quick charging (three and half hours) to give you a full thirty hours of power, even while steaming. The recharging case comes with a small moisture-removing brick, ensuring your hearing aids are kept in top condition while charging. The case also boasts three full re-charges once it is fully recharged. That means you can travel on weekends without cords and not worry about running out of power. The other great feature with this recharging kit is that your hearing aids will turn on immediately after removing them from case. 2. The Muse iQ CROS (RIC and BTE styles) also offers solutions for unilateral hearing. Again all the benefits of the iQ features are available for people with hearing requiring this type of amplification. The CROS systems can also utilise the rechargeable option. If you are after a hearing aid that offers flexibility in style, power and battery type, along with exceptional clarity and responsiveness to hearing environments, the Muse iQ could be the hearing solution for you. The Halo iQ can be found in the RIC and BTE styles and is a made for iPhone device. It’s Bluetooth technology is compatible with Apple and Android products, via the TruLink Mobile app. This hearing aid will give you pristine sound, speech clarity and the best feedback elimination technology in the industry. The TruLink Mobile App will work as a remote control for volume and ‘remembered’ environments. If you wear an Apple watch, you can utilise this function as well. With your iPhone you can get Siri to read your texts directly into you hearing aids. It also allows you to customise the sound quality to your personal choices and to record and play back audio. If you have tinnitus you can utilise the Multiflex Tinnitus application. It will also activate the GeoTag feature with your Memories. Can’t remember where you put your hearing aids? Don’t worry, there’s a ‘find my hearing aid’ application with the TruLink app as well. The Halo iQ can also be connected to the TruLink Remote which can be used with or without your smartphone. It will allow you to adjust the volume or mute your hearing aids, control the memory and the Geotagging features on your hearing aid. If you are after a hearing aid that is iPhone compatible, works with all ranges of hearing and will provide you with all the amazing Acuity features, consider the Halo iQ as your choice of hearing device. 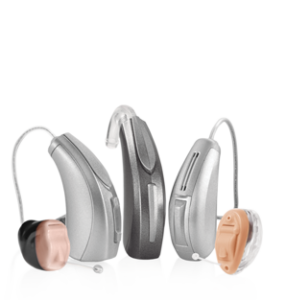 Starkey continues its reputation as the world leader in customised hearing aids with the SoundLens iQ. Acuity Immersion technology is encased in an invisible hearing solution with this product. Available in the premium level technology range this IIC will give you innate cues for greater spatial awareness. You will adapt with ease to all the new sounds you’ll be hearing, allowing your brain to remember and acclimatise to how your hearing should be. The sound quality will be natural as the SoundLens iQ can distinguish soft speech from louder sounds, allowing you to enjoy all your conversations, no matter the environment. These tiny hearing aids provide wireless streaming allowing you to connect to your favourite music and TV shows via a SurfLink accessory. These IIC hearing aids are customised to fit deep inside your ear canal for maximum all-day long comfort. If you are after a premium invisible solution that matches your mild to severe hearing range you should seriously consider the advanced sound quality and comfort of the SoundLens iQ.